Pleiades is a cluster of seven stars. Could it be a link to our past? Is the Star cluster Pleiades where the Human Race originated? My good friend, Dr. James Gillihan, a Cherokee man who was raised by the Lakota, shared wonderful Lakota traditions with me. Also, my good friend and mentor, Cherokee elder and wisdom keeper, John Red Hat Duke, enlightened me about many of the Cherokee and Hopi traditions. I was very blessed by both of these friendships. 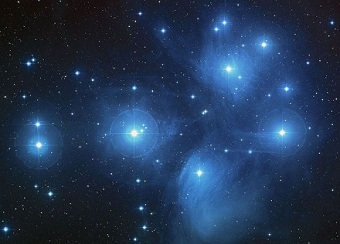 The Lakota and Hopi both have oral traditions related to their origination from the Star cluster Pleiades. When the Hopi see the seven stars overhead (seven stars of Pleiades?) then the members of the Two Horn Society begin to sing their creation songs. Dr. A.C. Ross, in his book, "Mitakuye Oyasin: We are all related”, shares with us some information about the Pleiadians, and their similarities with the Lakota Sioux. He said that the Pleiadians communicate mostly through mental telepathy, and the Lakota also communicate through mental telepathy especially during ceremonies. The number twelve appears in Pleiadian stories as well as biblical. It is interesting that the Pleiadians are apparently governed by a High Council traditionally made up of twelve highly advanced spiritual members. The “Pale Prophet”, who is said to have walked the Americas, selected twelve men who would continue his teachings after he left. We read in the Bible that Jesus selected twelve disciples whom he taught, and they were to continue his teachings after he was put to death. The Bible tells us about the twelve sons of Jacob who became known by their names as the twelve tribes of Israel. They were to be a light to the world. It does appear that the number twelve is very significant. Apparently the Pleiadians lived a culture of “all things common”, in community, much like the culture of the Lakota. They shared necessities with one another. It appears that the Pleiadians are working through selected individuals to help humans rise to a higher level of consciousness. They especially are known to contact the Lakota and Hopi Native Americans possibly because their minds are more open to those we call “aliens”. Many of the reports of those who have been contacted by the Pleiadians say that they appear to them in hooded robes. The Pleiadians apparently want to help humans evolve to a higher spiritual level of consciousness so that their minds, bodies, and spirits move into an existence of balance and harmony. In this way, they will also evolve into loving harmony with the “Power Source” of the universe.